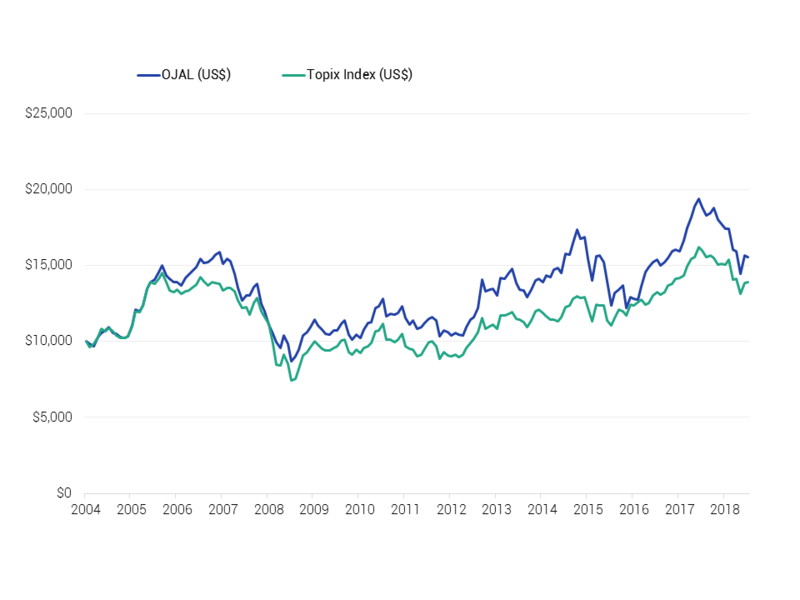 Optimal Japan Absolute Long Fund (‘OJAL’) invests in the Japanese equity market with the objective of maximising investor returns. This includes hedging the portfolio. Although the Fund’s NAV is denominated in USD, the underlying investments are in Japanese Yen securities and the Investment Manager does hedge this exposure to the Yen by using forward contracts. *Since inception (start date 1 September 2004). Data provided by Apex Fund Services. Of the 33 sectors that make up the Topix Index, only five had negative returns in February, with some of our former favourites making up three of these. We once had large weightings in the banks and real estate sectors, but a flat yield curve cured us of our liking for banks while poor attitudes to shareholders amongst the major real estate developers led us to divest these. Shipping was a great investment in the pre-GFC years as global trade accelerated but supply caught up with demand and shipping companies’ margins have struggled for many years now. The worst sectoral performance was in oil, although this was solely due to the 12% fall in the price of JXTG which alone accounts for 60% of the sector. We did not hold JXTG but own number two player Idemitsu which had a gain in February of over 3%. At month end we attended a conference in Japan and met with Idemitsu management for an update on the business as they approach the date (April 1st) of their impending merger with Showa Shell. Notwithstanding an expected annual decline in Japan’s petrol demand of 1-2%, the merged company should be able to maintain high margins as the industry closes old and inefficient refineries. Cost savings from the merger are also targeted at Y60bn by 2021 and at these prices, the stock looks a bargain to us, especially as it carries a 4.5% dividend yield to boot. It will not come as news to investors in the Optimal Japan Absolute Long Fund that the investment manager and the Fund’s board have decided to wind down the Fund. This is therefore our last Fund monthly report and as the Fund’s equity holdings had all been sold by month-end, this report contains no sector or stock contributions. We have written almost 180 monthlies for this Fund since its inception in 2004 and while sometimes it has been hard to find anything new to say, it has been a pleasure managing the Fund for that time and writing about Japan, the market and companies we’ve owned. We remain committed investors in Japan and intend to continue to regularly visit Japan and meet with companies. Japan’s markets have tested our patience over the past 35 years- more than we’d like to recall – but it remains a fascinating country with a resilient culture and many high quality companies that continue to flourish. We just have to keep working to get a just share of the spoils! Thank you for contact us. One of our marketing team will be in touch. *the fee is levied on the investment’s positive excess returns above the return on the Topix index (in USD terms) with a high watermark.